A former skating rink, and still known as the Rink locally. It's a big building with two levels of seating. Outdoors the colour scheme is red and brown, but indoors it is grey and white. Outside the main hall is an area with food and things to drink. The building is popular as a conference venue, rehearsal room and concert hall in addition to hosting Salvation Army services. 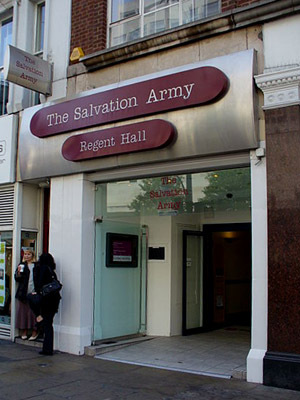 This is one of the oldest Salvation Army centres in London, having been founded by William Booth himself in 1882. There are no other churches in Oxford Street, but rather there are many shops of all kinds, various from all over the world. There are tubes and buses; no cars are allowed to come along. Majors Dawn and Graham Mizon. There were about 100 people, male and female, children and adults. There were lots of places to sit upstairs and on the ground floor. A woman welcomed me, gave me an information sheet, and said that I could go either upstairs or down as I wished. Once I was seated, others welcomed me also. There were no pews, but seats  very comfortable to sit on. People chatted during the pre-service and looked after the children. And there was very good music before the service started. Just an information sheet entitled "Regent Hall, Salvation Army Church and Community Centre." Piano, guitars, cornets, tuba. The children also sang to us  very good! An announcement was made about prayers for people who had broken their arms. This was a distraction  I felt sad for them and hoped that many would not do that again. We all clapped our hands as we sang about loving God and people. We also put up our hands up to pray to God. 8 – Major Graham Mizon spoke with a good mixture of teaching and Bible reading. We have lots of things to be grateful for, as God has been so wonderful to us and has blessed us so abundantly. But problems do arise sometimes, and we are often asked to make decisions. Unselfish decisions usually lead us to life. Short-term decisions usually lead to long-term disasters. We can make mistakes. The Bible helps us to make decisions that are pleasing to God. We all sin, but the grace of God brings forgiveness. God wants us to keep our eyes on Jesus Christ. Where have you pitched your tent? Hearing that God loves us, blesses us and helps us. I worried about my tent not always being pitched within sight of Jesus. People told me about the refreshments and where to go. The majors also spoke and were very nice to me. There was tea, coffee and many lovely eats for us. It was excellent. There were many things to eat. 8 – I loved being here, and if I come near it another time, maybe I can join. The singers and preacher were excellent and also the people near me were kind to me. I felt glad that I am a Christian, about God loving us, and that we should teach other people and also our children. God loves us and forgives us our sins.